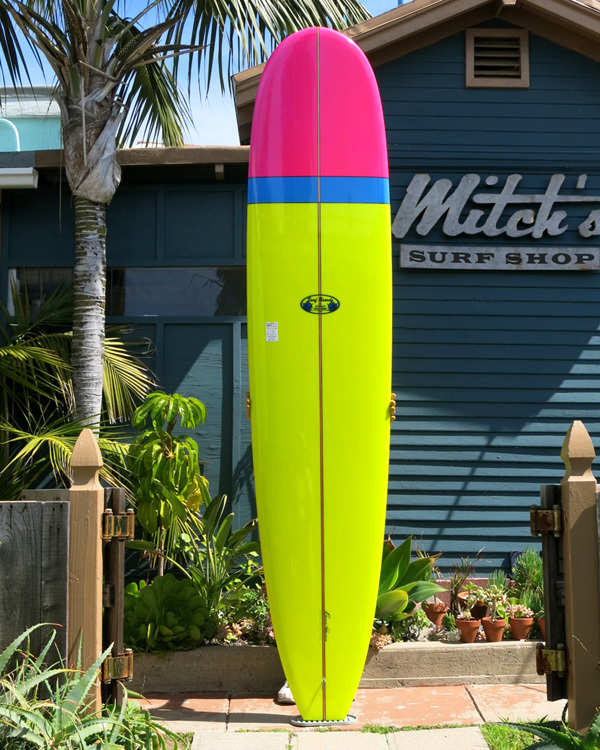 Takayama ITP with Bubblegum Pink Nose/Blue Comp Band/Tennis Ball Lime body; 1980's spray paint colors in a gloss & polish finish. Black pinlines at competition nose band and around the clear nose concave inlay. Black & blue lo-profile Takayama Oval and Ocean Tern logos. Classic Takayama t-band stringer of 1/8" Redwoods outside a 1/8" Basswood core. Nice butterfly style fin patch, 2+1 setup, FCS Fusion Fins and Takayama center fin all included. Length: 9' Width: 22 7/8" Thick: 3"
Nose: 19 7/8" Tail: 14 1/2"